Home > Thought Leaders > Blog > Skills > Payments > If bitcoin can’t succeed at money laundering, what can it succeed at? Police arrested Dmitry Zakharchenko, the deputy head of the Energy Industry Department of the General Administration of Economic Security and Combating the Corruption (GAESCC)… According to investigators, police seized a sum of some $120 million and € 2 million ($2.2 million). Who knew a life in public service could be so rewarding? I’m sure there are entirely innocent reasons why Dmitry had a A HUNDRED AND TWENTY MILLION DOLLARS in cash in his apartment. Perhaps he didn’t get time to pop to the bank, or perhaps the night safe was broken. Either way, I imagine it must have been rather inconvenient to step over flipping great wodges of cash to get to the bathroom in the middle of the night, so it makes me wonder why he didn’t either deposit the money in a bank (although I imagine yellow press scare stories about negative interest rates might have put him off) or convert it to something with less volume. Bitcoin might have been a good choice, but I suspect that like most people in a similar situation, the untraceable nature of cash must have been appealing for some reason. 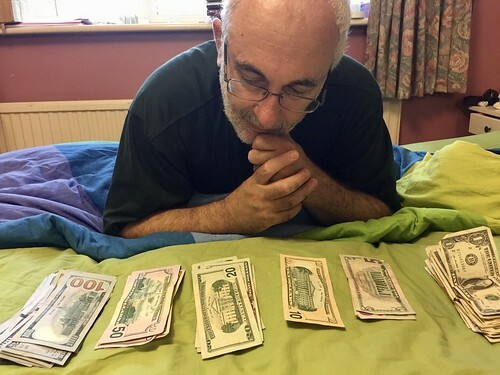 I keep my cash under the bed but I’ve put some on the top of the bed ready for Money2020. While people often refer to bitcoin as anonymous, it really isn’t. Ah, you might say. But in the world of bitcoin, smart criminals will use mixers and such like to obfuscate the origin of coins and thus confound the authorities. Yeah, whatever. That’s because criminals aren’t using it for large scale enterprise. As soon as they do, I don’t doubt that the relevant authorities will take quick and simple action. Bitcoins lack of fungibility makes it vulnerable to straightforward regulation in that respect. But what if law enforcement goes to the biggest miners in the world (representing at least 51% of the hashpower) and tells them that if they continue to confirm easily identifiable mixing transactions, they will be accused of money laundering. That’s that then. If bitcoin isn’t going to be used for money laundering, then what is it going to be used for? Certainly not the purchase of goods or services, not as a store of value (except for speculators) and certainly not as a mechanism for deferred payments, since there is no real reason to imagine that it will still be around a decade from now. Indeed. And most of them aren’t in America or any other developed market. I don’t have time to go and check the latest figures but as far as I know pretty much all of the Bitcoins in the world are being bought for Yuan and traded on Chinese exchanges. It’s easy to understand why. Bitcoin is more expensive and inconvenient than regular banking is, and far more expensive and inconvenient than regular banking could be if it starts supporting smart transactions on public ledgers without bothering with the baggage of mining. This robust (and accurate) remark from Bram Cohen (the chap who invented BitTorrent) is just what the Bitcoin chaps don’t want to hear. As I’ve said before, and will say again (having being falsely accused of being “anti-Bitcoin” today), I think Craig Wright’s observations on this topic are that ones that resonate with me. The mining of bitcoin is a security service that alone creates no wealth. Consequently, those using the network pay for the service. A shared security service that people will pay to use seems like a much better way to imagine Bitcoin than as a new form of payment or a new kind of currency. This shared security service may be used for a great many things, most of them as yet undiscovered, and I don’t doubt that people will try and possibly succeed to build a viable payment service on top of Bitcoin, but I am unconvinced that Bitcoin itself will be that mass market payment service to take on Visa and MasterCard. Can’t disagree with any points of fact here but beg the question, how can you have a secure public ledger without private validators? Get the UN to spin one up scattered across the continents and the states incur the cost themselves? I’m not being facetious here. Genuine question. Seems that the Blockchain is really a security technology and it’s child, Bitcoin, tries to compete with western union. > Who knew a life in public service could be so rewarding? Well, for a start, practically everyone in the non-OECD public service world knows where the corruption opportunities are. 1 btc now $4000+ ?